It is a truism in the news bizz that you have succeeded in writing a “balanced” story if all your sources take issue with and are unhappy with it. I never bought that (nor do others follow the precept). I much preferred it when both (all?) sides of story I had written – about a complex, grey-area, politicized local issue – were satisfied. It meant that I had listened and heard what might have been contradictory, divergent, or didn’t add up and conveyed that both sides had something relevant to say. It also meant that I had succeeded in writing a “balanced” story in the expectations of my peers. I was an “insider” operating within the journalistic world, functioning as my community expected. The way I have set up this book – focusing on practice more than problematizing the outputs, sometimes essentializing the journalist or over-simplifying the process – will undoubtedly mean I have pleased none of the people all of the time* (but, I would hope, all of the people some of the time). Which is as it should be. My goal is dialogue between journalists and linguists, among linguists, among journalists: to open up discussion, rather than shut it down. 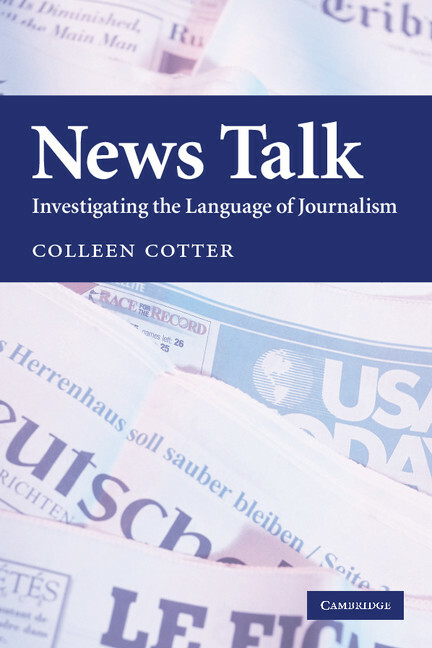 Linguists have the tools; journalists have the material; all have the interest. Let the dialogue begin. * Based on responses from “both sides” over the years, I can predict that some journalists will say I have been too academic and jargonful. Some linguists and anthropologists will say I have not been sufficiently critical. This is a predictable consequence. Indeed, one journalist friend who read a version of chapter 4 said his eyes “glazed over” reading about emic and etic constructs. A short while later, a linguist colleague who read the same chapter emailed to say he loved the emic/etic concept application and wanted more. That “minimal-pair response” reinforced my understanding of what is differently relevant to both communities.